A huge number of brokerage companies, which began to open en masse over the past decades, falls into the category of ambiguous events. On the one hand, new actors in the global financial market are compelled to compete for the “place in the sun” of all participants in online trading. Competition pushes brokers to search for the most interesting and promising offers for their potential customers. What does this give? Healthy competition helps to form a civilized market of services, in which the price of goods is formed under the influence of understandable factors. But there is also the other side of the medal. This situation allows fraudsters and adventurers to quietly join the ranks of decent brokers and freely deceive their customers. Therefore, acquaintance with the main participants of online commerce is the most reliable way to create your own database of companies you can work with. This review describes the main features and principles of the famous broker – NPBFX. If after reading the material presented, each user makes a reasoned (!) Choice (to cooperate with the company or not), then the author’s goal is achieved. ● NPBFX works with the license of JSC “Nefteprombank” (banking permits included a broker, up to 2016). ● Despite legal affiliation to the banking sector, the firm specializes in providing broker services. ● The main clients of the company were representatives of the HNWI / UHNWI segment, that is, the most wealthy legal entities and individuals. ● The company was one of the first among retail brokers implementing STP / NDD technologies, which exclude conflict between the parties to the transaction. In 2011, the administration introduces the application developed for financial market participants such as NPBFX and the MetaTrader 4 platform. The latter is connected to a liquidity aggregator and provides an opportunity to withdraw customer transactions to Tier 1 financial institutions. In 2016, the considered brand (more precisely, the sector serving private individuals) falls under the control of NPBFX Limited, with registration in the state of Belize. In the same year, the submitted trading platform receives the status of a member of the Financial Commission of category A, with the amount of compensation for each client of the company increased to $ 20 thousand. 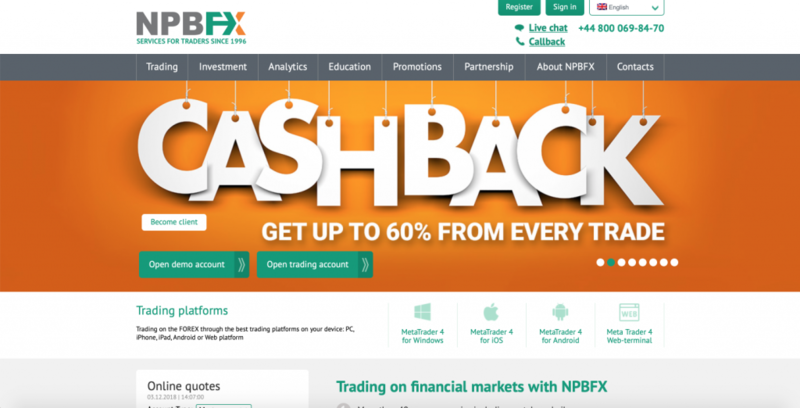 Before registering with NPBFX login, every potential user should carefully study this site. Find out what the company promises and how the company fulfills its obligations, clarify with which currencies and assets it works, read reviews of real analysts about it, etc. And to begin this procedure, best of all, with the security of users of the presented service. ● Age of the firm. As mentioned above, the broker has been working in the Forex market since 1996. ● High-quality new equipment is not only focused on the speed of transactions, but also on the protection of the trader’s financial / personal information. ● Working on the STP / NDD technology, the broker withdraws money to powerful (financially) liquidity providers. This allows you to cover the losses of some participants in the trading process, the money of other customers. In addition, each trader will receive what he was promised. ● Even on the basis of the information already outlined, there is no doubt that NPBFX is interested in the well-being of its traders (the higher their income, the greater the company’s turnover and the broker’s income). ● The company has a regulator and documentation issued by it. ● Availability of a compensation fund. ● 24-hour NPBFX support works 5 days a week (except weekends). The high professionalism of its employees, allows to solve almost any problems of resource clients. ● Lack of segregated accounts. ● A rather “weak” regulator. ● Registration in Belize and the absence of representatives in most modern business centers are perceived by many users as a serious problem. Indeed, according to many traders, it “slows down” the development of the platform. According to the latest data, today NPBFX with registration in Belize has the official license of this country, which gives the right to provide financial services. This is the IFSC (International Financial Services Commission). Of course, this is not an advanced institution that forces the “opening of the gate” of almost any service. But for beginners, IFSC in combination with guaranteed $ 20,000 (compensation to cover the company’s debts, in case of force majeure situations), is a serious incentive to register an account on this web site and work there quietly. What educational materials does the site administration offer for beginners or experienced traders who do not have professional education? In this case, if the lover of online trading is not too lazy, he will find all the necessary information that will allow him to earn money, regardless of the influence of external factors. ● General information about the financial market. ● Section “Questions and Answers”. ● Examples of trading strategies. ● Analysis of your own mistakes. But the most important among all the listed stages is, of course, a demo account specially created for NPBFX. With the help of virtual money you get the opportunity to enter into transactions, win / lose on their transactions, and in the complex – to approach the level of a serious trader. Experienced traders, briefly examining the general characteristics of the presented trading platform, often ask how well the reviews made by analysts about NPBFX correspond to reality? In this case, you can see all these nuances in practice. 1. Master. Deposit from 500 rub. / 10 $. Leverage – 1: 200. Spreads from 0.8 points. 2. Expert. A deposit of $ 5000 (ruble at the exchange rate). Leverage – 1: 100. Spread from 0.6. 3. VIP. Deposit 50 thousand. $ / 3 million Russian rubles. Spread from 0.4. Leverage – 1: 100. ● The minimum deposit is $ 10. ● Rate – from 0.01. ● Currency bills – the euro, the Russian ruble and the US dollar. ● Affiliate program – functioning. ● Trust management – is. ● Spread – from 0.4. Studying some reviews about NPBFX, you can find angry evidence that a normal broker / trader needs 1-2 ways to deposit or withdraw funds. Of course, everyone has the right to their own views, but in this case such a move would be a serious mistake. In one country, we all know it well, for a short period of time many e-wallets have been banned. So, these clients will be cut off forever from their broker? You must admit that this is complete discrimination (although a more crude word is appropriate in its meaning). ● Debit or credit plastic cards of Visa / MasterCard or Maestro systems. To work on the presented resource, not only traditional currency pairs are used, but CFD contracts for currency, metals, raw materials, etc. Whatever the situation on the global financial market, the broker’s customers will always find an interesting offer that will help them to significantly improve their financial position.